"Carlo Severi’s The Chimera Principle is a forceful study for anyone who wants to move beyond conventional concepts of 'text' and 'image. '… In this brilliant translation of what is certain to become an instant classic in visual anthropology, we come to understand how sound and image become alive in acts of communication." "The centrality of comparative interpretation to anthropology is dazzlingly illustrated in Severi’s The Chimera Principle. This is a book in the grand tradition of Claude Levi-Strauss’ Mythologiques. Severi begins with a meditation on a Zande harp, followed by a discussion of the art historian Aby Warburg’s expansive efforts to understand so-called primitive art. Warburg visited the Hopi in 1895–96 and became fascinated by children who, when asked to draw lightning, drew a snake. The lightning-snakes they drew become the prototype of Severi’s chimeras, artistic productions that Western analysts have consistently misinterpreted in terms of the referential function of language—a tack that leads them to categorize such objects as “crudely realistic,” “abstract,” “decorative” or “imaginary” (Severi 2015a:33–34). None of those terms, Severi argues, gets at the mnemonic and ritual functions of such arts, and he sets out on a grand quest, mainly across the Americas (but with forays into Oceania and New Guinea) to create a new “anthropology of memory and imagination,” as the subtitle of his book has it." "The Chimera Principle: An Anthropology of Memory and Imaginationis making a contribution to different fields of interest in anthropology: memory, ritual, and images, among others, bringing them together in a coherent argument… this is not just a collection of essays, on the contrary it is a very coherent volume with a sustained narrative that unfolds chapter by chapter." 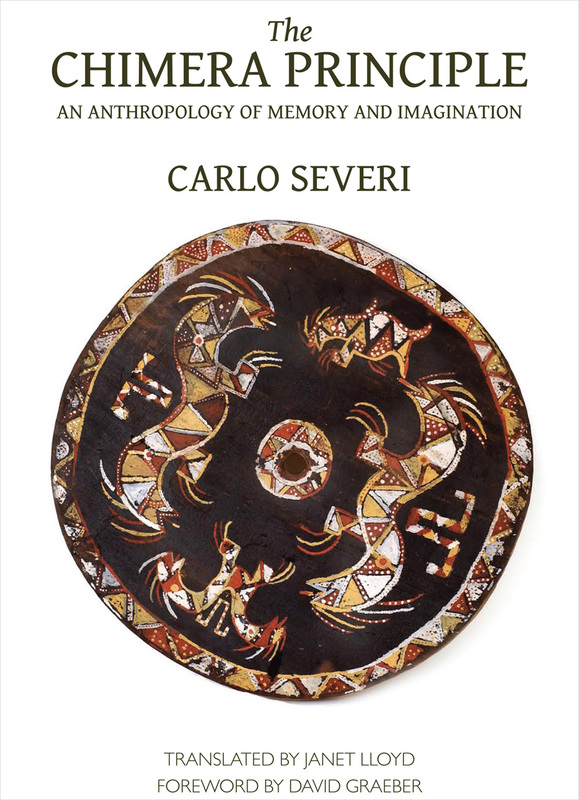 "Carlo Severi’s The Chimera Principle is an essential work of anthropological literature for the study of so-called 'oral' societies but also for researchers interested in the transmission of memory, belief, oral tradition, and so on…. Due to his groundbreaking reflections on the old anthropological concepts, The Chimera Principle has all the values of the monumental anthropological synthetic works worth reading and 'thinking with.'" "There are at least two ways of constructing memories, Severi urges. The first is narrational: legends, myths, and stories based on linear sequences in established genres. The second, contrastively, is a song form, depending on an iconic formulation of knowledge: as in shamanistic ritual action that constructs complex images characterized by simultaneity and condensation of certain commonplaces that the tradition would transmit. But the images are also chimeras: allusive, contradictory, unfinished, calling on the imagination of culture members to be collaboratively or dialogically exercised in ceremonial contexts for the purpose of together ‘remembering’ ‘the culture’... Carlo Severi’s book evidences much careful archival scholarship that would reconstrue earlier anthropological understandings of ‘primitive art’; rather than representations of the world, here are objects of memory and imagination that provide a codification of mental space. The book calls for a comparative anthropology of iconographic traditions that work through the mnemonic use of images – understood as the ‘non-Western memory arts’ (p. 19)." "Originally published in French in 2007 and now available in English for the first time, Carlo Severi’s influential The Chimera Principle is a book that seeks to transform the anthropology of memory and imagination, as its subtitle suggests. Based on Severi’s fieldwork among the Kuna of Panama, as well as on his extensive bibliographic knowledge of art and anthropology, the book considers long-standing anthropological questions such as the relationship between oral and literate cultures, the prevalence of the mnemonic form in Amerindian the ambiguous character of shamanic singers… and the relevance of projection to the anthropological concept of belief."